On Wednesday, more than 50 people gathered to celebrate one of the first organized flight services in the country – Wyoming Life Flight. 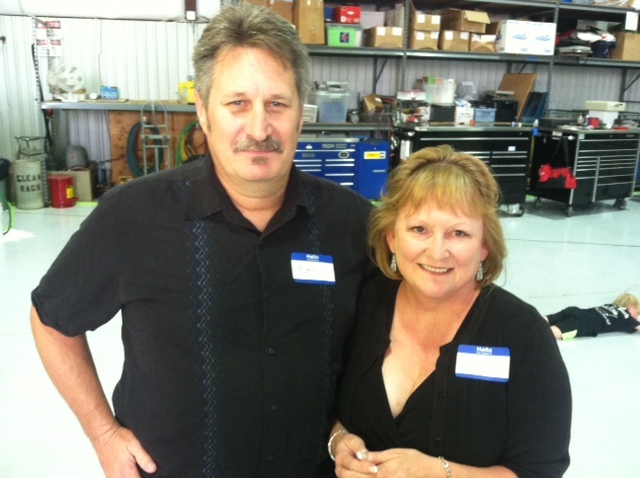 Darla and Alan Laatsch were among the first members of the Life Flight crew that launched in 1983. Darla had been working in the Wyoming Medical Center emergency room for about three years when she became the second chief flight nurse. Alan was an EMT, and while he was mostly on the ground, he flew when needed. Darla and Alan Laatsch left Wyoming in 1986 but made it a point to make it to the 30th anniversary of Wyoming Life Flight from their home in California. When the couple learned through a friend’s Facebook post that many of the original crew members would be celebrating the 30th anniversary in July, they decided they had to make the trip from Jamul, Calif., to be part of it. “We’re excited to see people. It’s fun,” Darla said. Darla’s parents still live in Casper and they used to make it back every year, but haven’t in recent years. Her mother’s birthday and the Life Flight event made for a good excuse to make the trip to Wyoming. The Laatsches moved to California in 1986, but Darla continued her flight career for nine more years in the San Diego area. She is now the clinical coordinator of student health at the University of San Diego. Alan became a firefighter and has since retired. Wyoming Medical Center started planning Wyoming Life Flight in earnest in March 1983. Service was set to begin on June 1, but, it turns out, patients simply couldn’t wait that long. The first flight was recorded at 2 a.m. on May 15, 1983. At its peak in the 2000s, the service flew 600 to 700 flights per year, reaching 768 flights in 2008. On May 15, 2013, exactly 30 years after the first flight, Wyoming Medical Center finalized its agreement with Air Methods to lead Life Flight through its next chapter. Air Methods, one of the largest and most respected air medical transport providers in the country, already supplied the helicopter, airplane, pilots and mechanics. The agreement called for Air Methods to employ the nurses and paramedics too. The helicopter and plane are still flying under WMC’s logo and there were no changes to existing Life Flight memberships, ensuring speedy and professional service to ranchers and people in isolated parts of Wyoming. Thank you to all of the pilots, nurses and paramedics, past and future, who have taken to the skies, both clear and stormy, to bring expert medical care to patients wherever it was needed. 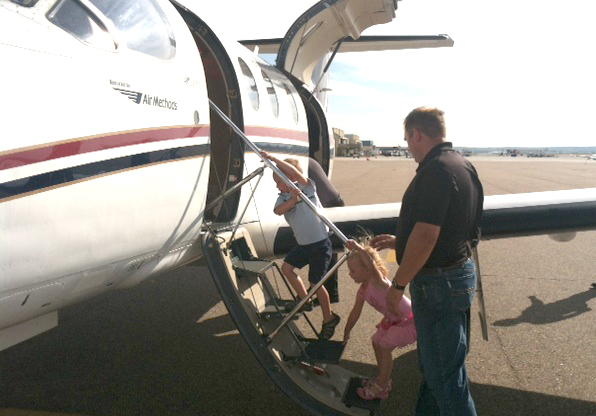 Mike Conrad, a Life Flight mechanic, helps his children, Gwen and Spencer, climb the steps of Life Flight’s airplane.